"Webmaster's Maps" are outline maps with coordinates for imagemap. They help you to publish web contents about Japan. How to Save Maps ? Hold down the right button of your mouse on graphics and select "Save As". Territories are divided into provinces. So you can easily color each provinces. Because Japan is so spreaded country (south to north, west to east), the map is partly pressed, partly enlarged, and twisted. 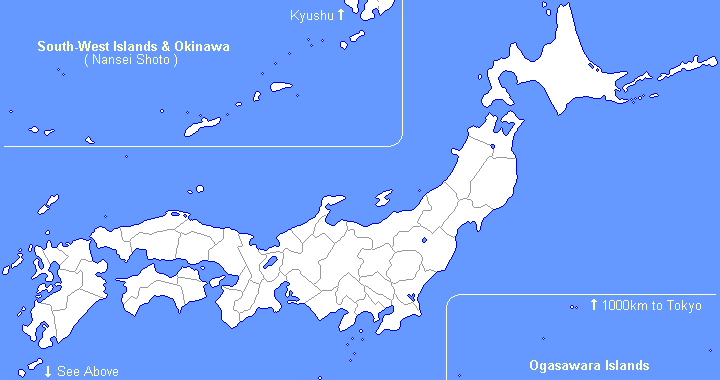 South-West and Ogasawara Islands are divided from other part of the country. The map is compact & dense though it's far away from reality. Links to Japanese Web Sites (Regional Section). Please change the value of links & alternative texts. Alternative texts are written in Japanese. The most typical character set in Japan. These files are offered as linkware. You are required to create a link to this website. It is not always necessary to creat links on same page where graphics are used. You may create links on any page of your website (e.g. in reference links). But the page must be open to the public. Do not redistribute these files. Only for use in your own website. Copyright©2004-2007 Nobuhito Kasai, All rights reserved.